There are about a hundred reasons I should not be posting a recipe for Shepherd’s Pie, the least of which is how many times I’ve badmouthed it over the years. I’m sure if you’ve read this blog for any amount of time, you’ve heard me lament. I’m not sure who I am and how I got here, but I’m doing a complete 180 today. I can honestly say that I never, ever thought I’d be posting a recipe for Shepherd’s Pie. For that reason alone, you know it has to be good. Thanks to Danielle, a sweet reader who emailed me and nicely, but forcefully, told me I needed to give Shepherd’s Pie another shot, I think I’ve been converted. Danielle, like me, had been traumatized by the instant mashed potatoes, canned green beans and microwaved hamburger Shepherd’s Pies of her youth. However, when a friend of hers brought “the most delicious Shepherd’s Pie” she had ever had, Danielle knew Shepherd’s Pie needed to be part of her life (and mine, too). So here’s the deal, this version of Shepherd’s Pie might look like a bit more work than using a lot of instant products, but I’m going to go out on a limb here to say that homemade mashed potatoes is the first step to reinventing this classic. And unless you have an egg allergy, don’t skip stirring in that egg yolk. It might seem unneeded but it lends such a delicious, rich creaminess to the mashed potatoes that you’ll be wanting to eat Shepherd’s Pie every night for the next decade. And the meat filling. Flavor. FLAVOR! Hearty and delicious, it’s fabulous and doesn’t take that long to put together. I have a hard time finding ground lamb in my neck of the woods, but I’ve made this several times with different varieties of ground meat and it is stellar each time (I’ve included some notes below the recipe title). I wasn’t quite sure what the fam would think about Shepherd’s Pie. My kids had never eaten it before but they had heard me talk about how they should never, ever make me Shepherd’s Pie on my birthday. They knew the history, and my baggage had become their baggage. For pure comfort food at it’s best, this Shepherd’s Pie can’t be beat. And on a completely random sidenote, little Cam (2 1/2 years old) thinks it’s called “Cow’s Pie” and we have been unable to convince her otherwise. Preheat the oven to 375 degrees F. Lightly grease a 9X13-inch pan with cooking spray (I've also used a slightly smaller ceramic casserole dish with good results, too, just makes the layers slightly thicker). Place the potatoes in a medium saucepan and cover with 1-2 inches of water. Add a teaspoon of salt. Bring to a boil and cook for 15 minutes or so (it will depend on how large or small the potatoes are cut) until the potatoes are tender. Drain the potatoes and return to the pot. Mash the potatoes lightly. Add the butter, milk (start with 1/2 cup and add more if needed), Parmesan and cheddar cheeses, salt and pepper to taste, and garlic powder. Mash together until smooth and creamy. Stir in the egg yolk until combined. For the meat and vegetable mixture, in a large 12-inch nonstick skillet over medium heat, add the ground meat, onion, carrots, garlic, salt and pepper. Cook, breaking the meat into small pieces, until the meat is no longer pink and the vegetables are starting to soften, 5-7 minutes or so. Drain any excess grease from the mixture. Sprinkle the flour over the meat and cook over medium to medium-high heat for a minute or so, stirring constantly. Stir in the tomato paste, broth, Worcestershire sauce, oregano, thyme, and rosemary. Bring to a simmer and continue to simmer gently for 10 minutes. Stir in the corn and peas. Pour the meat mixture into the prepared pan. Spread the mashed potatoes over the top all the way to the edges of the pan creating a seal over the meat mixture. Sprinkle the 1 cup cheddar over the top of the potatoes. Bake for 35-40 minutes until the edges are golden and the casserole is bubbling. Let it rest out of the oven for 10 minutes before serving. The ingredient list looks daunting but I promise this all comes together quickly. While the potatoes are boiling, I start the meat and vegetable mixture - multi-tasking is your friend. You can use a variety of different ground meats here. I've made this once with just ground turkey and another time with a combination of ground beef and sausage. Yum! Danielle, who sent me the recipe, uses ground lamb and sausage which would also be delicious (ground lamb is a bit hard to find where I live). Recipe Source: adapted from a recipe sent to me by a reader, Danielle, who got it from a friend and convinced me I needed to give Shepherd’s Pie another shot (I reduced the butter and cheese a bit and changed up the spices and meat based on what I had on hand) – it looks very similar to this recipe by Alton Brown, no wonder it’s good! I have a tendency to like spicer food, so I decided to add a few things. To me, Irish food is a bit bland. I can say this because I am 100% Irish so please don’t start reprimanding me. I added more salt, pepper, onion carrots, garlic, flour (I used cornstarch for my gluten-free daughter-in-law), Worcestershire sauce, thyme, corn and peas. But the addition that made all difference was 2 1/2 cups of Guinness in addition to 1 cup of beef stock. I like gravy and I wanted my pie to have lots of gravy. I also made far more potatoes. The pie was a huge hit and everyone at my St. Patrick’s Day lunch wanted the recipe. I made the potato layer and the meat filling the day before, refrigerated the two separately, warmed them up the next day, assembled and then baked. I did this because I didn’t want to mess up the kitchen before the guests were coming at noon. I think this added to the flavor because all the meat ingredients got to meld. Thank you and Danielle for this recipe. My husband was also traumatized as a child, which drew me to this recipe, lol! I showed him the recipe and he reluctantly agreed to try it. Even walking in the house he looked at the pan with his nostrils flared! Then he ate it. And he got seconds!! Seconds is a true sign of a delicious meal for him! He said we can’t call it Shepherd’s pie though because of all the memories, so Cow Pie it is! Good one! I have 4 boys, too. They are not mashed potato fans, but loved the meat. 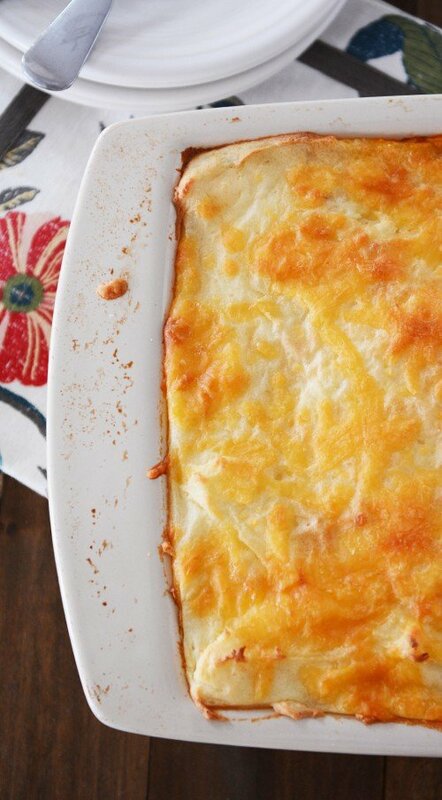 My husband LOVES shepherds pie – I’ll have to try this version. If you’re ever in Orlando the Disney Springs Irish restaurant Raglan Road has the most amazing shepherds pie! Made this with leftover Christmas mashed potatoes. Used ground turkey and turkey sausage. So delicious! I topped it with some french fried onions for the last 5 min in the oven. Added a nice crunch and flavor! can I put this together the day before and bake in the morning? would it change the bake time? You’d probably want to add 10-15 minutes on the baking time if it’s coming straight out of the refrigerator and into the oven. OH. MY. YUMMY!!!! This was so full of flavor and easy to throw together. I haven’t had a shepherd’s pie like this before and that is a pity because everyone ought to taste this version! I used half ground beef and half Italian sausage. My husband took one bite and declared that this needs to be in the regular rotation. It blows his mom’s version out of the water…and he liked that one until he tasted this. WOW!!! I recipe. I am half way through the recipe, meat mixture completed. I used 2 lbs of ground beef in the recipe. I found it very bland & had to doctor the meat mixture up with additional beef instant stock mix to boost flavour, more Worcestershire, more tomato paste, more salt & pepper & a bit more broth. Extremely disappointed. I like the tomato soup meat mixture better. Unfortunately, I didn’t have a can available because this would have helped with the bland flavour. I am not going to try the mashed potatoes according to the recipe because I was disappointed with the filling. I will make my own mashed potatoes & add the sharp cheddar. Can I omit the tomato paste and keep all other ingredients the same? My husband loves Shepherds Pie, but doesn’t like tomato based ones. It would change the flavor and I haven’t tried it myself, but you could experiment. Good luck! This is so good! A vast improvement from the Shepherd’s Pie I grew up eating. The meat filling is delicious! While I have never had cheese on top of Shepherd’s Pie, I will say that we cussin’ love it that way! This is going in the oven now for dinner. Yum! Thanks for the recipe. Made this last night for potluck and prayer! It was delicious and fun to make,! This was great! I just made it tonight to feed the missionaries and we all enjoyed it! Way better than the canned green bean, tomato soup concoction of my childhood! Thanks Mel! This turned out so well………seriously good! Holy potatoes, Batman! This is the first time I have EVER liked shepherd’s pie. It was a delightful 180° from the green bean tomato soupy dish with instant potatoes from my childhood (where I would literally only eat the cheese on top). The herbs came through wonderfully and the ratios of everything were just right. I did cheat on the mashed potatoes by using leftovers from Mel’s amazing IP recipe (I added in some generous shakes of parmesan and stirred in the egg yolk before adding on top of the meat), and that helped cut down on prep & cook time, too. The flavors in this recipe were amazing, but my meat and vegetable mixture turned out too liquidy. Did I not drain the meat properly? I am not sure. Feedback is welcome! Hmmm, I’m not really sure why, Carol – you might try adding a bit more flour next time OR cutting down the broth. Carol, hope you don’t mind me chiming in, too. I drained my whole meat & veggie mix in a large sieve/colander before adding it back to the pan. Were you able to do the same? Using the colander helped get off the little bit of grease (I used 93% lean ground turkey), plus the water that’s generated from cooking the onions and carrots. If you did strain all the liquid off after Step 4, then perhaps the simmering time in Step 5? I used my super large 14″ skillet and almost all of the extra liquidy-ness (totally a word, right?) was gone by the end. Just enough that everything was coated in a sauce, but not drippy or wet (like how a pasta salad is coated but not runny…if that makes sense). I hope you give it another try and it turns out well! Aileen, I concede to your logic and greater knowledge of food history. I confess, this version of Shepherd’s pie just reminded me of my own personal trauma of Girl Scout campfire stew as a very young girl. It haunts me still and I’m almost 64 years old. To this day I refuse canned veggies and can detect reheated and instant potatoes from a mile away. No excuse for any of it. Of course, I’m probably the only weirdo in the United States of America who is repulsed by the thought of fish tacos. Please forgive me my quirks. Thank you for setting me straight on the Shepherd’s pie debacle. Still don’t care for mutton though. May my Scottish forebears forgive me that quirk, as well. This recipe is enough to give anyone Shepherd’s pie trauma. Absolutely disgusting. I grew up in England. Who decided that cheese and corn were acceptable ingredients to include? It’s not a garbage can recipe. Even this simple meal has rules. No green beans or canned veggies. Apalling. Revolting! Ghastly!! Elizabeth – I’m so glad someone out there is FINALLY policing recipes for authenticity. The liberties some people take with authentic international cuisine is astonishing. Don’t even get me started on what Americans have done to sushi. I once spent three days in Japan. I can tell you, they don’t add cream cheese to their sushi, nor would they ever consider deep frying it or covering it in some Americanized spicy mayo like I’ve seen in some putative sushi restaurants. Total quease. However, I do have to rebut your point on THIS particular recipe, which I’m remise to do as a fellow food cop. I have a lot of Irish ancestors, so I know a great deal about Shepherd’s pie, which is actually a traditional Irish recipe (not English – you guys have the knock-off “fish pie” variant which, no offense, is repulsive). It is literally the epitome of a “garbage can” recipe as the peasants would throw anything they had into it! Except for frozen veggies – they couldn’t afford those. Normally it was just the blighted vegetables that weren’t good enough to export to England. And thank goodness for those exports, because otherwise we may have never had the dish! It was those exports which created systematic, generational poverty and oppression of my Irish kin, which led them to create the most SAVORY dishes like Shepherd’s pie, mutton, and who can forget – boiled cabbage! I’m not totally surprised that the Brits would continue their Irish oppression by creating strange rules about what can be included in this Irish delicacy, but I suggest you brexit on this one and leave Mel to her artistic liberties. I heard a rumor that some food bloggers are adding BEANS to CHILI and calling it MEXICAN. I suggest we gang up on them and correct that indignity once and for all. I have no words. . My family loved it Mel:). Thank you! Can this recipe be made ahead? Could I pre assemble it and bake it later? Yes, it can be made probably 12-24 hours in advance and refrigerated. I have never made shepards pie before but I followed this recipe cutting it down just a little since there is only two of us. My husband couldn’t get enough so tonight I am making a full size recipe and freezing leftovers for some night I don’t have a lot of time. I make the mashed potatoes with a combo of peeled sweet potatoes and small golden potatoes with the skins on–I leave out the egg yolk. Love it! Hi! How many does this receipe serve? As a general rule of thumb, is there a typical # of people all your recipes serve? Usually the recipes serve about 6, but that sometimes depends – the yield is located right above the recipe title, if that helps! This one serves about 8. Have made this three times since finding the recipe, and the whole family loves it! Mel, have been making this very same shepherd’s pie for years. Am so sorry it took you so long to find it. I never heard of those really bad recipes. They sound dreadful. Well at least you now know that SP can be delicious. Uh oh…I happen to LOVE instant mashed potatoes! Guess I’m the only one in the world. I make this recipe with ground turkey, Italian sausage, and spicy Italian sausage all together, and it is freakin’ to die for! Made it for a large crowd (who were kinda dreading it when I told them what I was making!) and they all went crazy for it — not a crumb left, even with instant mashed potatoes on top (with the cheese, of course, like the recipe calls for. Tonight I’ll make it with real potatoes, just because everyone on this thread says it’s fabulous. I’m making it for another large party on Saturday, and will be freezing the whole shebang. Fingers crossed it reheats well! I’ve always really enjoyed Shepherds Pie in restaurants. Decided to make it myself, chose your recipe via Yummly, and omg! Where has this dish been all my life?! My husband and I both had to force ourselves to stop eating more. I had to thank you! A solid hit! Made this to take over for dinner to someone’s house, and it was so good. So delicious! I didn’t add the egg to the mashed potatoes and used only frozen peas and corn, no carrots. My husband is still talking about it and our Swiss student went back 3 times! I will definitely make this again! (true test will be on my 4 children)! Fantastic! Husband and kids loved it! I made this shepherd’s pie recipe tonight for our St. Patrick’s Day dinner and we all LOVED it!!! The kids told me over and over how much they like it. We all ate seconds. One kid even ate thirds. They want to bring it to school for lunch tomorrow and said they “want to eat it all day.” What a keeper! Thank you. Hey Mel – I made this about a week ago for my family – delish! I am going to make it today for two friends who had babies last week. Question – can I make this up to the baking point and then freeze it for a week? Not sure about how the mashed potatoes will do. Thanks! Hi Katie – I’ve actually never frozen this so I can’t say 100% but I know a lot of people freeze Shepherd’s Pie just fine. If you’re worried about the mashed potatoes you could freeze the bottom portion and add the mashed potatoes before baking. Good luck! I made this tonight for supper and my husband and three boys loved it! I had leftover baked garlic mashed potatoes that I used on top and then instead of 2-2 1/2 lbs of meat I used one pound of ground beef and then added about 2 1/2 cups of quick cooking bulgur that I prepared on the stove. You couldn’t tell much of a difference in the final product and I saved money and sneaked in some healthy bulgur! Thanks for all your tasty recipes! Hi Mel! 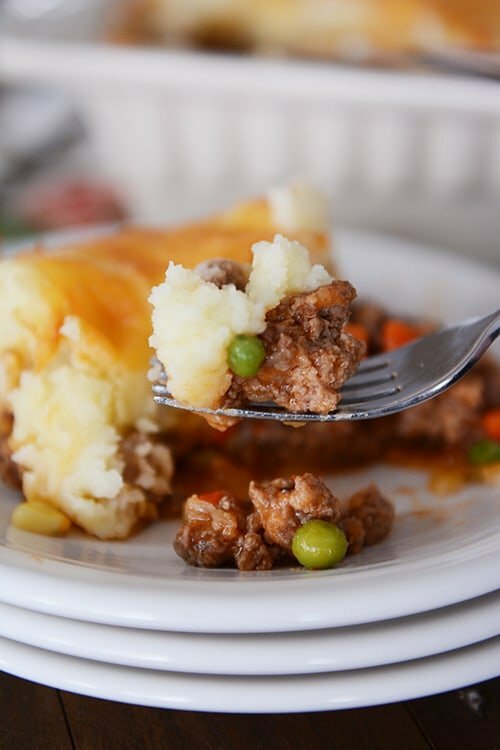 Shepards pie is one of my favorite comfort foods and I love this version so, so much! I’ve made it probably 20 times now and It’s the only one I’ll make for the rest of ever! Thank you for posting!! Made this tonight and used my leftover Thanksgiving mashed potatoes! Another awesome recipe, Mel!! Thanks so much! I’m so glad I stumbled upon your website a few years ago!! What would you think about adding puff pastry to this dish? How would you recommend I do that lol. Also, I don’t enjoy ground meat (much to my dismay) I was thinking of adding in shredded beef instead! I can’t wait! Thank you for the best website! Hi Krista – I suppose you could try laying the puff pastry over the meat filling and bake it up that way but since I haven’t tried it, I can’t say for sure. You might try googling similar recipes and see if that leads you in a good direction. I finally got around to making this and I enjoyed every bite. It’s definitely one of the best recipes I’ve tried in while. Thank you for am you do. I’ve never made Shepard’s pie before but thought I’d try it since I had some homegrown potatoes and carrots on hand. Saw your recipe online and it turned out beautifully! Very delicious! 1 tablespoon of tomato past. What do you do with the rest of the can? I refrigerate or freeze to use in later recipes. This has made my pickies eater’s top 10!! Best Shephers Pie ever. I love the parmesan in the potatoes! Oh Mel! I don’t think I’ve made shepherd’s pie for my family – ever! That all changed with this delicious recipe. We had it tonight for dinner and it was sooo good. I didn’t make a single change to the recipe and it’s going in my “keeper” file – which houses mostly your recipes anyway! P.S. I did use Yukon golds instead of russets because that’s what I had on hand. For the meat I used 1 pound 96% lean ground beef and 1 pound Jimmy Dean all-natural sausage. I have been looking forever for a shepherd’s pie recipe that wasn’t just a meat/veg combo with instant potatoes on top. This was very, very good with a lot of good flavor, not just of the meat, and not just of the potatoes (which was a favorite with my son, the cheesy potato king), but the combination of everything was, well, worth seconds. Which we enjoyed. Thank you for this. My daughter asks for Shepherd’s Pie at least once a week. But she has never eaten an instant potato EVER and I hope to keep it that way. 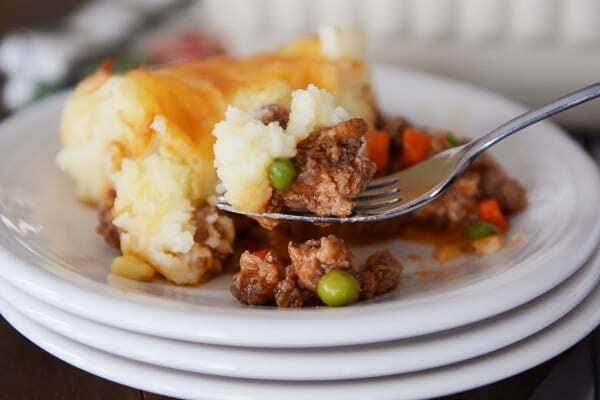 Shepherd’s Pie with real food is one of the tastiest meals out there!!! It takes a bit of work, but it is so good and I just make a huge batch so we can have leftovers. It seems to heat up really well. I make mine with broccoli, peppers and onions. So yummy. I haven’t made shepherds pie in years, and when I did it wasn’t this delicious!!!! We had this for dinner tonight and everyone loved it. Serious comfort food! 🙂 Thank you for all your hard work in posting such great recipes that my family loves!! I made it in one go. Family loved it. Thanks so much. Wanted to upload pic too but didnt know how to on this. Will do on fb. We made this tonight for St.Patrick’s Day. It was FABULOUS! Just like you said, I had to leave behind all my previous ill-conceived memories and judgements about shepherd’s pie. It was a delicious AND an authentic Irish dish. I made this tonight, another success! I’ve tried so many of your recipes all with great turnouts. Whenever I am looking for a recipe I ALWAYS look here first. Some of our favourites include the sweet and sour chicken, the chocolate bunds cake from a box with additions to it and the lemon squares. Great site Mel! Recipes like this help me enjoy cooking again! If it tastes as good as it smells baking in the oven, we are in for a treat tonight. Thank you! Today is March 14, 3/14, Pi Day (for all the math geeks out there), which seemed a fitting occasion to try this pie. It is fabulous! I had shepherds pie when I lived in England as a child, but this version is way better. It must be because of the cheese. Thanks so much for a terrific recipe and a new tradition for Pi Day! Mmm! This sounds good. I personally like Shepard’s Pie but never knew of someone who would ruin it with fake mashed potatoes. Yuck! I’ve only had my English SIL version. It’s simple. Seasoned hamburger, corn and green beans, a prepared package of brown gravy and then the mashed potatoes topped with a bit of cheese. I’m going to try this recipe out and see what we think! Thanks! Hi Kristin – shredded (not the canned kind) and if you can, shred it yourself from a block of Parmesan (it melts a lot better because it isn’t coated with powder like the preshredded kind). I made this last night with 1.5 lb ground sirloin and 1 lb turkey sausage (JennieO brand). It was excellent and me meat and potatoes loving husband had no idea their was turkey in it. Another keeper! I made this for dinner tonight and it was absolutely delicious! My family devoured it. Thanks, Mel, for another fantastic recipe!! This is exactly the Shepherd’s Pie recipe I have been looking for. Absolutely delicious. Just letting you know that I made this a day ahead in two 8 inch casserole pans. I made as instructed,then gave one away to my mom and baked the second one for our dinner. This came out really super delicious. This recipe is replacing my usual shepard’s pie recipe. As usual, your recipe came out perfect. You have never steered me wrong. Thanks Mel! I made this last night and we loved it! I substituted green beans for the peas, as my husband does not like peas. This version is much better than the one I used to eat as a child in the school cafeteria. Made this tonight to rave reviews from my husband (and me!). He’s a big Shepherd’s Pie fan – I’m less inclined to make it due the the time and endless possibilities of bland recipes out there. This is definitely a “Sunday night” dinner, as I like to call recipes that take some time – the measuring, chopping, cooking, and baking does add up, but is absolutely worth it. My end result had a bit more liquid to it, some that spilled over onto the top (despite my best attempt to seal with the mashed potatoes), but it did not impact the taste at all. Can’t wait to try the leftovers – there are tons – it was seriously getting better the longer it sat out of the oven. Thanks for another tried and true recipe, Mel! Oh my goodness, Mel! I considered this recipe for a week and decided to make it tonight. My husband and sons devoured half of it in the first 10 minutes. My youngest had three servings and all said I needed to make it when my oldest son is home from college. I served it with the puffed Brie bites. Thank you so much for providing so many incredible recipes week after week! This would fit into the four canned chicken tins I use to make chicken pot pie in to freeze. (They don’t have the linings that are distasteful to some of us) and give us 4 meals, ready to bake and eat. I used to make shepherd’s pie with ground beef and spaghetti sauce with some vegetables added in, then topped with real mashed potatoes, and they all still love it. In 55 years of cooking, I have never used instant potatoes, and I never will because I have eaten them at pot luck suppers. No wonder so many people don’t like shepherd’s pie! I am thinking of trying to fry frozen hash browns, though, to prepare in a hot skillet, but they probably rinsed all the starch away which means the shreds won’t stick together. I wonder if they would make decent mashed potatoes. We make Alton Brown’s recipe at least once a month because it’s just that delicious and it’s one way I can “hide” veggies so my toddler will eat them. For most families you can make enough to last two nights so the extra effort is worth it. We will have to try your take on it! We made this and it was delicious. We were fighting over the leftovers throughout the week. It would also be a good take-in meal– nice, universally liked flavours. I don’t think we’ve ever finished a 9X13 of anything that fast. I made this for dinner last night, not ever having tasted Shepherd’s Pie before and liked it! I began making this recipe at 5:30pm and by the time it was out of the oven, it was past kids’ bedtime so my husband and I enjoyed a date night in when he got home from work. Kids will try in tonight for dinner. I used ground turkey and thought it was great. My husband (who had a sour taste in his mouth from tasting it in the past was turned off I was making it for dinner) but after eating one serving he liked it. I have never had shepards pie, but have always wanted to make it (homemade everything). This looks like the perfect recipe to try for the first time. If you and your family loved it, I know my family will love it, too! Mel- your son’s annual birthday survey is adorable! Where The Red Ferns Grow is one of my all time favorite movies, even though I cry my eyes out every time I watch it! beans (I take a few moments to cut these into smaller pieces). then uncovered for 10 minutes. Gosh Mel…I guess your next cooking show should be in Billings, MT to prove to some people that our hometown really is pretty great!! Now on to making Shepherds Pie!! How come you make every food sound so delicious? I suddenly have a craving for this and I never thought I would! I made this and I didn’t tell my family about what Cam called SP, but my 3yo started calling it cow pie, too! Ha! I guess it comes from living in a place where the forest is full of the other kind of cow pies. Forgot to mention–how cute is it that your son wants to be a chef when he grows up?! We tried this last night! I’ve had pretty much the same thoughts about Shepherd’s Pie until now. It was really yummy and, although it wasn’t quick, it was easy. Because I used ground beef and ground chicken sausage that was well seasoned, I didn’t add the oregano/rosemary/thyme to the meat mixture. I also accidentally forgot the worcestershire sauce and it was still really tasty. My husband had a conservative first helping and then went back for more! Oh, Mel! I am cracking up! I think you’re going to as well. I had never ever wanted to try something called “shepherd’s pie.” Not even if Gordon Ramsey said it in his Scottish turned British brogue. And a friend brought if for a meal when we lost our child. I definitely didn’t ask for the recipe. Never ever wanted to try it again. He didn’t remember ever having shepherd’s pie and he had planned this meal 2 weeks in advance!! He did a trial run when I was out of town and used the kids as guinea pigs. Can you believe it? I still am so blown away by all of it. But laugh that for Valentine’s day he made me shepherd’s pie. LOL Of all the things, why shepherd’s pie?? He said he wanted to try something he thought he could cook. So it has built up his confidence and maybe I can get him to cook more often. Oh my gosh, that is too funny, Kimberlee. Bless you for being gracious during the Shepherd’s Pie Valentine’s meal. I think that’s awfully sweet that your husband went to so much work (a trial run, really??). Last night was the first time I have ever made Shepherd’s Pie/ Cottage Pie. Thank you:) I will be adding this to my list of go to dinners! Made this tonight for dinner…..delicious! Thanks Mel! It’s a keeper! Great Pie!! This is the one we eat. i make it Gluten Free by using arrowroot powder in place of flour and it thickens up nicely. I just got done making The Sheppard Pie. Put it in the oven and Realized I Forgot to add the egg yolk to the potatoes. What will that do to my 1st ever Sheppard Pie? I love Shepherd’s Pie, and so does my family! I made this last night and had everything on hand (used ground dark turkey meat). It was really delicious. Loved the addition of the tomato paste. It added a nice richness, as did the worcestershire sauce. Enough for leftovers–we all loved it, thanks. 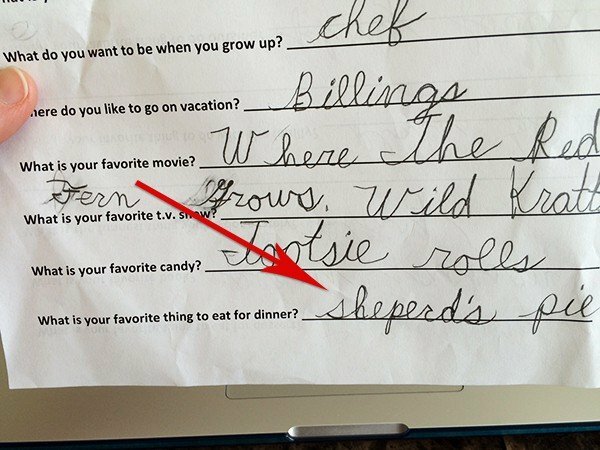 I love that your son wrote Billings, MT as his desired vacation spot! Hilarious! I agree 100% about using homemade mashed potatoes. It makes the biggest difference in the over all dish. If you have access to ground bison (we get it at costco ) it’s also very good in shepherd’s pie! I’ve never minded Shepherd’s Pie, but have never loved it. Although I’ve always used real potatoes, it’s always been the meat mixture I haven’t loved. I’ll have to give this one a try if you love it, cause my hubby loves the stuff and would be thrilled if I made it for him! Also, that’s adorable that Cam calls it cow’s pie, so cute! HA! I’m totally going to try this again ONLY because it’s from you and I so often trust your judgement completely on all your dishes, you have yet to lead me astray! The past couple years I’ve always cooked shepherds pie with a “white” version for the meat: shredded chicken, green beans, cream of mushroom and some milk. It’s always my go to meal to take into people because it’s a hit for all ages! I’ve never heard of instant potatoes in shepherd’s pie, nor microwaved hamburger. Wow. Our family has always loved SP. I made this tonight using ground elk from the elk my brother just got a few months ago…delish. This is most definitely the best shepherd’s pie I’ve ever made/had. Thank you! I just had to comment on how impressed I am that your 9 year old can write in cursive!! I have 3 children and in our school system (in Virginia) they are only taught cursive briefly in 2nd grade. My 10 year old cannot even read it when someone sends him a card and they have written a note in cursive. I have come to love shepard’s pie now that I make a “non instant” version. I use ground turkey and make a sweet potato topping with a small amount of cheese. Someitmes I use both white and sewwt potatoes…depends on how I am feeling I guess. Thanks for sharing this version…yum. Two suggestions to elevate an already scrumptious dish. – substitute braised meat chunks – stew size – for the ground meat. – top it with a bechamel sauce flavored with your choice of cheese. 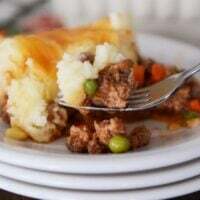 I love Shepards Pie and this is very similar to my recipe. Very, very yummy and such a great dish to make ahead. My one and only question is why would anyone EVER USE INSTANT POTATOES???? That is just WRONG ! Do you think I’ve made my feelings clear about instant potatoes? Your nine year old want to go to Billings MT?????? We live in Bozeman MT……..much better place to vacation! Ha! I agree, I’m from Montana, lots of other nice places! 🙂 Mel, I love your site, I’ve been a long-time reader, thanks for helping me make dinners my family loves! There are other beautiful places in Montana but you can’t beat the allure of visiting grandparents! I thought later…maybe the grandparents live there! And you are right…some gorgeous spots along the river and outside of town. Like others who have commented… only because I saw it here might I try it! Agree! I only go to Billings if I have to. Foam roller yes! Many ways to do it depending on where your body needs it. I suggest youtube. Totally sign up for another shorter race so that you can feel what it is like. I suggest a 10K if you can find one. It will help you mentally to know that you have basically run 1/2 of a 1/2. Keep up the great work! Can’t wait to make the shepherd’s pie. One of my husband’s favorites but I never make it either. And he wants to be a chef when he grows up! I love your blog, taste in food, and you’re a real mother! And a good one to boot. Greetings from the frozen North up here in New Brunswick, Canada! This is too funny! 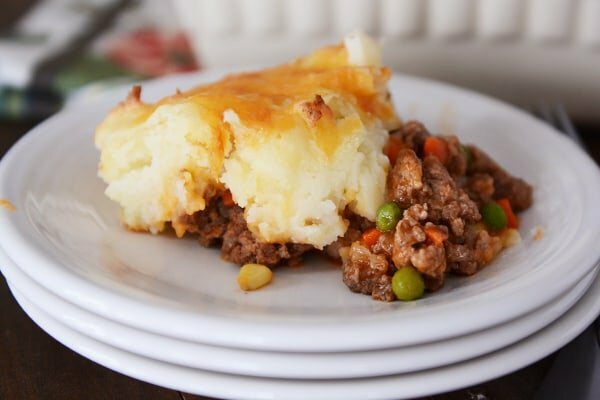 🙂 I just searched your blog last week as I wanted a GOOD Shepherd’s pie recipe and figured it would have to be yours! No luck that day, but I am glad you had a change of heart and posted this delicious sounding recipe. I will be sure to try yours the next time my famiy is craving this yummy comfort food. It’s about time, Mel! I’ve been waiting for Shepherd’s Pie to come into my life, but I’ve never trusted another’s recipe for it (do you get what I’m sayin’?). I know I can trust yours. I’ll be serving it. Forgive me, I forgot the real reason I wanted to post a comment. Your 9 year old has great taste. What first jumped out at me was the favorite movie. ” Where the Red Fern Grows”. It has been one of my favorite books for more years than I care to divulge. I reccomend it to everyone who has a young boy or girl about 8 to 10 years old who loves the out of doors. Just stock up on tissues. What timing. I prepped Shepherd’s Pie last night. . . to be cooked and eaten later this week. I make mine with leftover roast and gravy, couple of handfuls of frozen veggies, topped with real mashed potatoes and cheese. You must of heard me yelling a state away, at my fridge, 4 cups left over mashed potatoes. Why doesn’t mel have a shepherds pie recipe? I would never make shepherds pie unless it was yours. I’m scarred from my mother in law throwing the contents of her fridge with, yup, instant mashed on top and saying “shepherds pie” shudders. Thanks for coming to the rescue. Again. I, unlike most commenters, love shepard’s pie. Although I learned something new today (always a good thing!). What I have enjoyed is cottage pie. My family has been engaged in some sort of farming (dairy and beef), for decades, so beef is frequently on the table. We usually knew the name of the animal who provided our supper. Camelia burgers were a favorite, she was NOT a nice cow. Which was a big reason she became a supper cow. If you want an even faster supper, you can do what we call hamburger gravy. Just make the meat part as recipe states, and serve over mashed potatoes. You can be eating in 30 minutes, it is filling and tasty. Hope I haven’t offended anyone with the dose of reality. Not offended here Gina. You made me laugh!!! Poor Camelia! That’s hilarious! Not a fan of Shepherd’s Pie. If you have changed your mind maybe I should give this one a try. I lived in the UK from 2009-2014 so I have tasted some wonderful Shepherds Pie but have been yet to taste a recipe I really liked that also tastes authentic! So thank you for posting.I usually only post comments on your site after I have tried and loved your food, but this I haven’t made yet. It looks very promising! As a side note, which you may already know, if they use beef they call it Cottage Pie and if they use lamb it is Shepherd’s Pie. I’ve never heard of using sausage. Though they have all sorts of sausage and pork pies in England, they are quite different. Interesting. I look forward to trying this. I trust your judgement completely. I follow loads of blogs but yours is my ‘tried and true recommend to anyone’ blog! Hi Tara – always look forward to seeing your comments pop up. You taught me something new today! I didn’t know the difference between Cottage and Shepherd’s Pie so thanks! As an Englishwoman born and bred, I can tell you that Tara is right.. Cottage pie = beef, and Shepherds pie = lamb… But most people call it shepherds pie even with beef. I know, we are a strange people! Ha ha! Also, I always brown my onions first before adding my ground meat, I find it adds another layer of flavour! i made it tonight Mel and YUM! Loved it! Really really yum. Thank you for another keeper! I have to say, I never knew Sheperds pie would ever be made with anything instant! Your recipe looks a lot like what we have always made in our family, although I might try adding the spices you suggest. Worcestershire sauce is our friend! Shepherd’s Pie has long been a favorite of mine – probably because of my love for REAL mashed potatoes. I’m looking forward to trying this recipe, but I’ll be leaving out the peas. My family despises peas. Ha! Shepherd’s Pie is good……it’s ultimate comfort food in the UK where I come from……but having said that…..yes, it can be bad, lol! With instant ingredients and beans…….? Never! Was usually made to incorporate the left over roast from Sunday dinner. Please…….can the words, instant mashed potato NEVER be mentioned here again, Mel? My daughter will love this. My mom made shepherd’s pie when I was young and it was ok. This recipe sounds much, much better. Thanks! If anyone can convince me to give Shepherd’s Pie a shot, it’s probably you…But I come with my own baggage. As a kid, when my older sister was feeling particularly mean after a fight, she would request Shepherd’s Pie for dinner just because she knew I hated it. 😉 But after living in the UK, I know I need to give this peasant food another shot. You may have just convinced me to do it. It seems like it might be great for -40F North Dakota evenings. Definitely making this tonight. I already know my husband will love it. I’m sure I will too, and I’m even optimistic about my kids! Would this work to be put together a day ahead and baked the next day? Yes, and you can freeze it for a meal and bake like a frozen lasagna. If you freeze frozen REAL mashed potatoes, it will most definitely change the consistency of the potatoes and they will not be as creamy and smooth as fresh. I haven’t tried assembling and baking that way but I think it’s worth a shot, Tammy! Alright…I’ll try it but only bc you have never steered me wrong before! When you say sausage are you referring to ground italian sausage or ground pork (breakfast) sausage? Hey Bryn – I usually use a ground turkey or chicken sausage (uncooked not the precooked kind).